Andό, B. (2015) ‘As Slippery as an Eel? Comparative Law and Polyjural Systems’. In V. V. Palmer, M. Y. Mattar, and A. Koppel (eds), Mixed Legal Systems, East and West, London: Routledge: 3–16. Aristotle, (2004) The Athenian Constitution, P. Rhodes (trans.). London: Penguin. Cotterrell, R., (2001) ‘Is there a Logic of Legal Transplants?’ In D. Nelken and J. Feest (eds), Adapting Legal Cultures, Oxford: Hart Publishing: 69–98. Donlan, S. P., (2015) ‘To Hybridity and Beyond: Reflections on Legal and Normative Complexity’. In V. V. Palmer, M. Y. Mattar, and A. Koppel (eds), Mixed Legal Systems, East and West. London: Routledge: 17–32. Emilianides, A. C., (2006) Beyond the Cyprus Constitution [in Greek]. Athens: Sakkoulas Publications. Finnis, J., (2011) Natural Law and Natural Rights. Oxford: Clarendon Press. Flavius, G. (H. Kantorowicz), (2002) Der Kampf um die Rechtswissenschaft, Baden-Baden: Nomos Verlag. Focarelli, C., (2012) International Law as Social Contract: The Struggle for Global Justice, Oxford: Oxford University Press. Graziadei, M., (2006) ‘Comparative Law as the Study of Transplants and Receptions’. In M. Reimann and R. Zimmerman (eds), The Oxford Handbook of Comparative Law, Oxford: Oxford University Press: 441–476. Hatzimihail, N. E., (2015) ‘Reconstructing Mixity: Sources of Law and Legal Method in Cyprus’. In V. V. Palmer, M. Y. Mattar and A. Koppel (eds. ), ‘Mixed Legal Systems, East and West’, London: Routledge: 75–99. Hobbes, T., (1982) Leviathan , London: Penguin. Husa, J., (2006) ‘Legal Families’. In J. Smits (ed. ), Elgar Encyclopedia of Comparative Law, Cheltenham: Edward Elgar Publishing: 491-504. Johns, C. H. W. (trans. ), (2011) The Oldest Code of Laws in the World The code of laws promulgated by Hammurabi, King of Babylon B.C. 2285-2242, A Public Domain Book. Kelsen, H., (1957) ‘The Natural law doctrine before the tribunal of science’. In H.Kelsen (ed. ), What is justice?, Los Angeles/Berkeley: University of California Press. Koukiadis, D., (2015) Reconstituting Internet Normativity: the role of State, private actors, and the online community in the production of legal norms, Baden-Baden/Oxford: Nomos Verlag/Hart Publishing. Legrand, P., (2001) ‘What Legal Transplants?’ In D. Nelken and J. Feest (eds), Adapting Legal Culture, Oxford: Hart Publishing. Markesinis, Sir B., (2000) ‘Our Debt to Europe: Past, Present and Future’. In Sir B. Markesinis (ed. ), The Coming Together of the Common Law and the Civil Law, Oxford: Hart Publishing: 37–66. Mousourakis, G., (2012) Fundamentals of Roman Private Law, Berlin-Heidelberg: Springer. Palmer, V. V., (2012) ‘Mixed Legal Systems’. In M. Bussani and U. Mattei (eds), The Cambridge Companion to Comparative Law, Cambridge: Cambridge University Press. Palmer, V. V., (2012) ‘Mixed Jurisdictions Worldwide: The Third Legal Family’, Cambridge: Cambridge University Press. Palmer, V. V., (2014) Mixed Jurisdictions Worldwide. The Third Legal Family, Cambridge University Press. Palmer, V. V., Mattar, M. Y. and Koppel, A. (eds), (2015) Mixed Legal Systems, East and West, London: Routledge Publishing. du Plessis, J., (2006) ‘Comparative Law and the Study of Mixed Legal Systems’. In M. Reimann and R. Zimmerman (eds), The Oxford Handbook of Comparative Law. Oxford: Oxford University Press: 477–512. Posner, R. A. and Landes, W. M., (1989) ‘An Economic Analysis of Copyright Law’, Journal of Legal Studies, Vol. 18: 325–363. Schlesinger, R. B., Baade, H. W., Herzog, P. E., and Wise, E. M., (1998) Comparative Law – Cases, Text, Materials, 6th ed. New York, NY: Foundation Press. Smith, T.B., International Encyclopedia of Comparative Law, vol. 6, Property and Trust, Brill Publ. (1974). Smith, T. B., (1965) ‘The Preservation of the Civilian Tradition in “Mixed Jurisdictions”’. In A. N. Yiannopoulos (ed. ), Civil Law in the Modern World, Baton Rouge: Louisiana State University Press: 3–26. Some, A., (2014) The Cosmopolitan Constitution, Oxford Oxford University Press. Symeonides, S. C., (2003) ‘The Mixed Legal System of the Republic of Cyprus’, Tulane Law Review, Vol. 78: 441–455. Van Hoecke, M. and Warrington, M., (1998) ‘Legal Cultures, Legal Paradigms and Legal Doctrine: Towards a New Model for Comparative Law’, International and Comparative Law Quarterly, Vol. 47: 495–541. Versteeg, R., (2011) Law in Ancient Egypt, Durham, NC: Carolina Academic Press. Voigt, P. and von dem Bussche, A., (2017) The EU General Data Protection Regulation (GDPR): A Practical Guide’. Cham, Switzerland: Springer International Publishing. Walker, N., (2014) Intimations of Global Law, Cambridge: Cambridge University Press. Watson, A., (2000, December) ‘Legal Transplants and European Private Law’. Electronic Journal of Comparative Law, Vol. 4.4. Available at https://www.ejcl.org/44/art44-2.html. Quotations from The Cyprus Review are welcome, but acknowledgement of the source must be given. 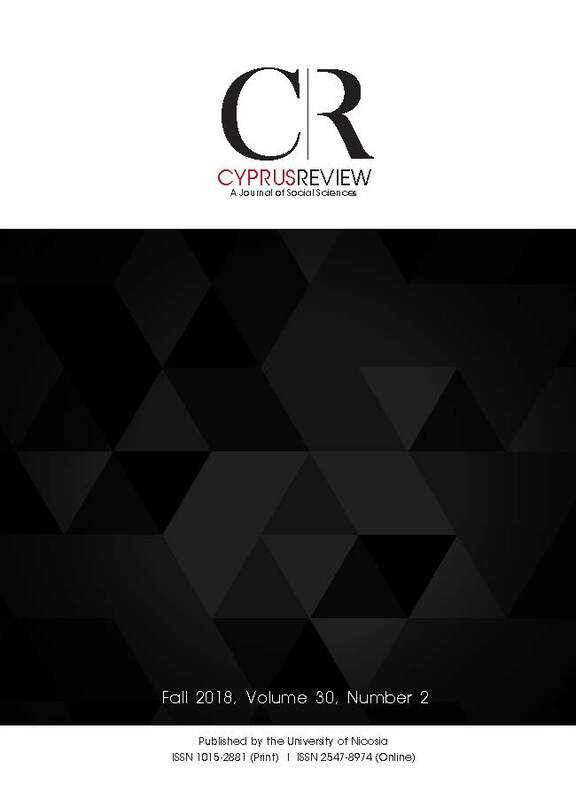 The editorial team of The Cyprus Review is announcing a Call for Papers for a special section of the Spring 2019 issue which will be in honour of the Cypriot sociologist Caesar Mavratsas. He was one of the first Professors of Sociology at the Department of Social and Political Sciences in the newly established University of Cyprus. Deadline is 25 May 2019. Nicos Trimikliniotis is guest editing the section.